Fp10 Flight Pack Air Data Engine.- Power supply. Power for the GPS and PC is provided by Flight Pack. Only one power connection from Flight Pack to the battery is required. The Fp10 Flight Pack has a comprehensive power supply system which is simple to install and able to supply the high current that a PC can require to top up the internal battery. 1. V1000 Vario supply which powers all signal paths in the Flight Pack. Note: The optional Battery Backup PK312 can provide several hours of operation without the main Aircraft battery. The internal battery of the PC and GPS can maintain a complete navigation system independent of the Aircraft battery. 2.Flight Pack contains a high efficiency power supply that is fully protected that can deliver up to 2 Amps @ 5 volts to power a PC and GPS. 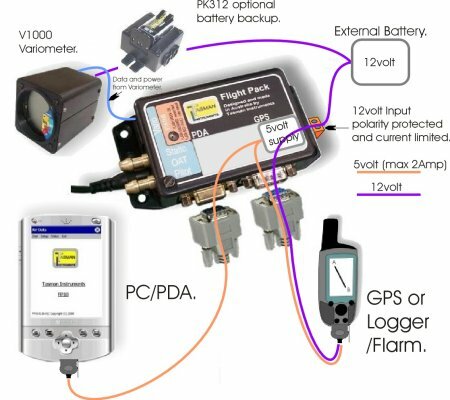 Note that if the GPS is a logger with internal power supply such as CAI302, Flight Pack can be ordered without internal power supply but Flight Pack connections will route power from the Logger to the PC. (Order Fp10).